The scenery in the west of Big Bend National Park is more varied than the east, and many of the interesting sites are close to the 30 mile Ross Maxwell Scenic Drive, which links Santa Elena Canyon with TX 118 north of the Chisos Mountains, and is definitely the best road in the park; from the undulating foothills west of the mountains the route offers several good viewpoints of the desert below, then descends quite steeply into a region of small canyons, colorful mounds and eroded rock, before arriving at the banks of the Rio Grande. The drive forks off Highway 118 about half way between the western Big Bend entrance near Study Butte and the park headquarters at Panther Junction, a fairly level road across open, gently sloping land with small, isolated summits that passes several primitive campsites such as Croton Spring, Paint Gap and Grapevine Hills, but no features of special interest. 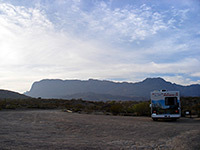 Highlights along the first half of Ross Maxwell Scenic Drive include the disused homestead of Sam Nail Ranch, eroded red rocks and another old ranch building in Blue Creek Canyon, a fine view of the desert at Sotol Vista Overlook, the water carved formations of Burro Mesa Pouroff, and Mule Ears Spring, a sheltered oasis reached by a 1.9 mile trail. A little further along the road, a much shorter trail leads to Tuff Canyon, a narrow but deep ravine in the desert. 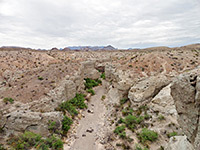 The enclosing rocks are volcanic tuff, quite resistant to erosion so the canyon has developed high walls; most watercourses flow across sand or mudstone and form shallow valleys with sloping sides. Another path descends to the mouth of the canyon and allows for upstream exploration. 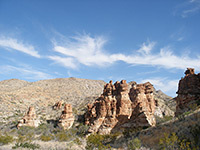 The land south of Tuff Canyon is low in elevation (under 2,400 feet) and especially colorful, with contrasting white, black and red rocks. 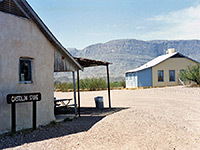 Five miles beyond and close to the Rio Grande is the historic settlement of Castolon, which has scattered old adobe dwellings and farm machinery plus a small general store still in operation. Nearby, the Cottonwood Campground contains 31 sites in a quiet, scenic setting with the river banks on one side and a high rocky hill (Cerro Castellan) to the other. 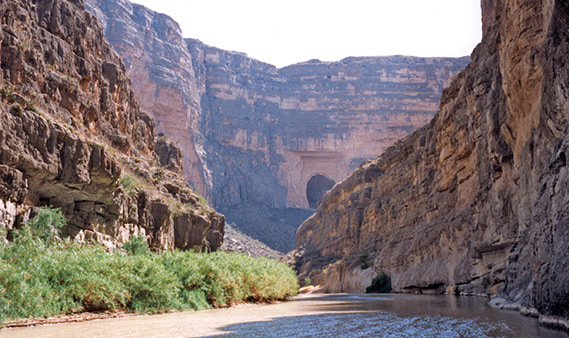 The main reason to drive this far is to visit beautiful Santa Elena Canyon along the Rio Grande - the start of the path into this 1,500 foot deep gorge is 8 miles beyond the campsite, right at the end of the paved road. After visiting the canyon (a hike which might involve wading a stream), most people drive back the same way, but there is an alternative route to the west entrance station; the unpaved Old Maverick Road. 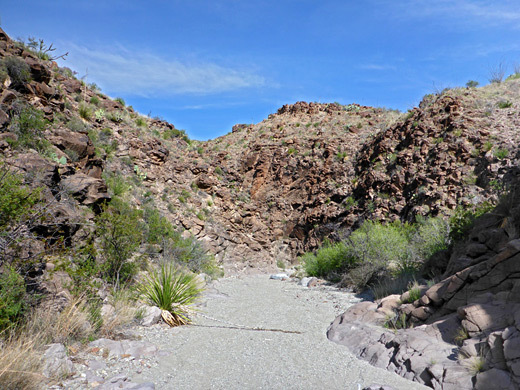 This is maintained so usually fine for all vehicles, starting close to the Santa Elena trailhead and reaching TX 118 just inside the park boundary after 14 miles across generally flat, desert terrain. The only problems may be occasional streambed crossings, as these may be rocky and/or muddy after recent rainfall. The surroundings are rugged and unspoilt, and there is an interesting old cabin en route (Luna's Jacal), home of a lone resident early this century.